Is it possible for one country to be both insanely endearing and incredibly heartbreaking? Welcome to Rwanda, one of the friendliest, cleanest and most enigmatic countries you’ll ever travel to. Nearly everyone in the Western world has heard of the small central African country of Rwanda. Rwanda has no pristine beaches or high-rise resorts. Nor does it have vast reserves of gold, diamonds or oil. It’s not a safari playground for the rich, though it is home to the rarest gorilla species in the world, the Silverback. But more than likely, you, dear reader, know of Rwanda for a very different reason. You can’t have a conversation about Rwanda in the U.S. without the topic of genocide coming up. Genocide isn’t a party-starter to say the least, and you certainly won’t find anyone in Rwanda talking about it, save for ex-pats and aid workers. Indeed, in the spring of 1994, almost 20 years ago, something unspeakable happened here. An unthinkable tragedy on a scale rarely seen in the full span of human history. An estimated 800,000 to one million minority Tutsis and moderate Hutus were slaughtered by sticks, knives and anything else cheap and readily available. It took the Khmer Rouge in Cambodia about 2-3 years to exact a death toll of one million. In Rwanda, it took the extremist Hutu Interahamwe a mere 100 days. Undoubtedly, if Rwandans had a choice in the matter, they would rather the rest of the world associate their peaceful and beautiful country with anything but the deep scar emblazoned on the forehead of the nation. Yet, it is a gigantic elephant in a tiny, lush and hilly room that has influenced nearly every aspect of political and social life over the past two decades. It was a deeply anguishing and incredibly violent chapter in the history of the nation that saw the systematic extermination of 10-20% of the entire population. In later posts, we’ll delve deeper into the events and aftermath that defined the Rwanda genocide. This post, however, is intended to acknowledge what took place, then move nineteen years beyond to present day Rwanda, one of the most endearing places I’ve every visited. Rwanda’s central location on the African continent. The Republic of Rwanda, located in fabulous central Africa just south of the equator, is a country characterized by lush green mountains and lakes. Its population currently stands at 12 million — double the population of just 20 years ago. 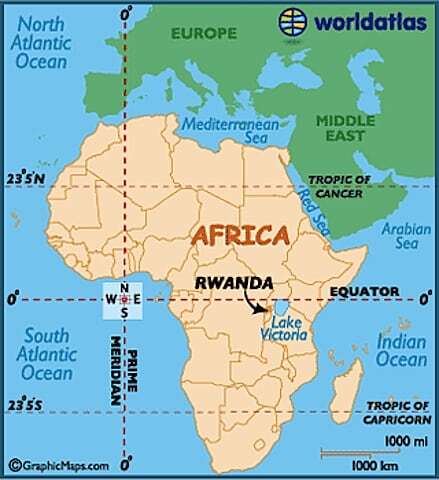 Rwanda shares borders with Uganda, Tanzania, Burundi and everybody’s favorite neighbor, the DRC. You may have been drinking Rwandan coffee for years without even knowing it — over a quarter of Rwanda’s premium coffee exports are bought up and sold by Starbucks and Costco. The World Bank has ranked Rwanda as the 8th easiest country in the world to start a business. It’s also worth noting that the donning of seat belts and motorcycle helmets are mandatory here, though not necessarily at the same time. 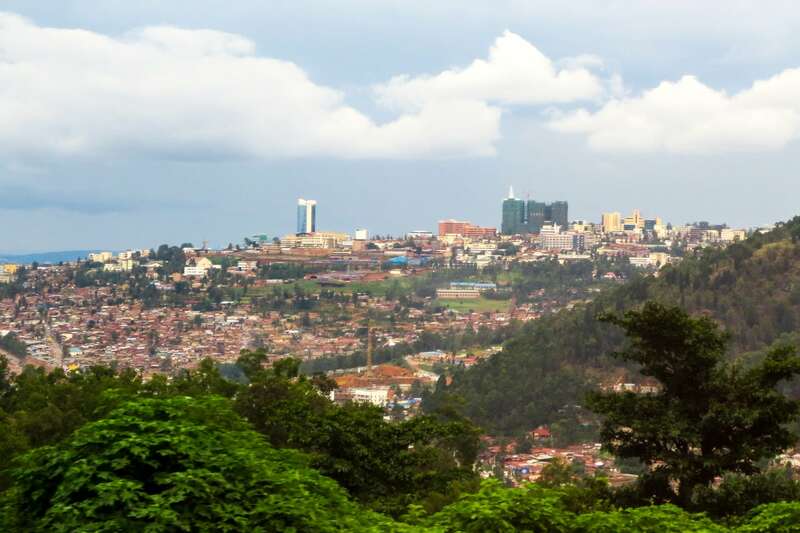 Kigali, Rwanda’s beautiful hilltop capital, sits proudly perched on one of the “thousand hills” of Rwanda. My journey starts where most Western visitors begin their time in Rwanda, the mile-high capital of Kigali. 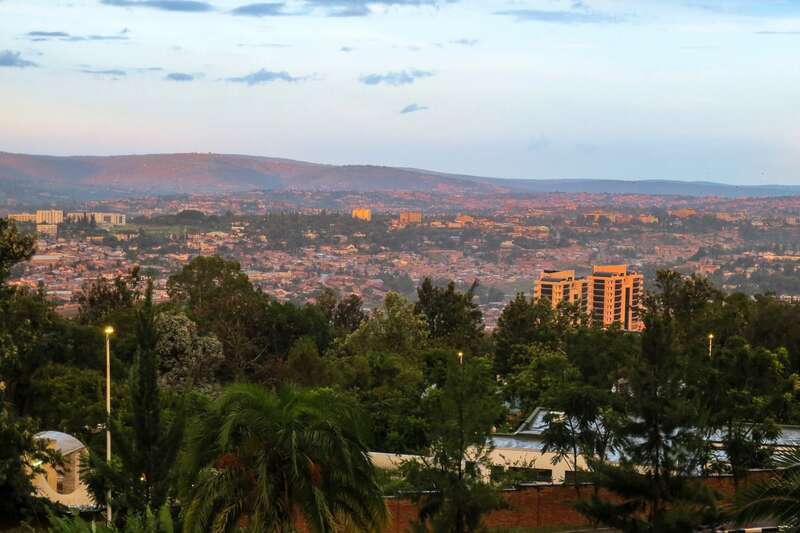 Unlike many other African capitals, the true heart of Kigali is entirely African. At independence from Belgium in 1962, the new government moved the seat of power from Astrida (now Butare) north to its present location in the center of the country. Rwanda is known as “le Pays des Mille Collines” or “the Land of a Thousand Hills,” from which the now famous Hotel des Mille Collines (AKA “Hotel Rwanda”) derives its name — and standing in the city center of Kigali its easy to understand why. Hills, upon hills, stretch to the horizon in every direction. If you only think of dry savanna when you think of Africa, a visit to Rwanda will permanently alter that misconception (along with a visit to dozens of other countries on the continent). Kigali is one of the cleanest and most organized cities you’ll visit anywhere. Here, you won’t find crumbling roads lined with trash and stray dogs. In fact, plastic bags are illegal in Rwanda (they confiscate them from you at the airport, so conceal them well if you must bring them, or don’t bring them at all), and all Rwandans are required one Saturday a month to devote the entire morning to cleaning up their neighborhoods. The city recently completed a massive beautification project which, among other things, lined the main avenues with palm trees, gardens, and stonework. The streetlights are even topped with little hats proudly displaying the national colors. Oh, and Kigali’s tiny and efficient international airport is one of the most enjoyable anywhere to transit through — upon arrival, I simply walked down the steps of my Airbus A330, across the tarmac, through a doorway, up to the immigration counter, down a flight of stairs and out the door. No muss, no fuss. Sunset over Muhima and Rugenge neighborhoods of Kigali from the City Center. Sitting at 1600m (5,250 ft.) across four ridges, Kigali is one African capital that will take your breath away in more ways than one. As of March 2013, Mastercard/Maestro is not widely accepted (if accepted at all). Make sure you bring debit/credit cards with the Visa symbol, or else you’ll be in for a world of hurt. MTN SIM cards can be purchased at the airport for around $1 USD (including some airtime). I generally prefer Airtel given that I can never seem to be able to text the U.S. with MTN. Data and voice rates are very reasonable. Don’t forget, the network in Africa is GSM 900/1800 so your unlocked North American phone won’t work here (unless its dual-band like the iPhone). WiFi is widely available, albeit slow. Driving is a pretty relaxed affair compared to many other countries in the region, though moto-taxis can be a nuisance. Electricity is about as reliable as it gets, though, like anywhere, blackouts can occur on particularly hot days. Anti-malarials and sunscreen are recommended for travel to the region, but consult your friendly local tropical travel clinic first about the anti-Malarials. European style toilets and toilet paper are common in Kigali, but not guaranteed outside of the capital. Generally, you can flush the toilet paper. Landlocked Rwanda can be expensive, but deals can be found by shopping and dining at more traditional establishments rather than tourist and ex-pat eateries. Crime is low, and violent crime, virtually non-existent. While French was the national language under colonial rule, English is widely spoken (better in fact than many of the more traditional Anglophone African countries). And, if you happen to speak Kinyarwanda you’ve hit the jackpot! Kinyarwanda is spoken by practically everyone.